Roast both peppercorns in a dry pan for about 2 – 3 minutes till fragrant. Rub pepper salt all over duck inside out. Steam the duck for about 2 – 2 ½ hours till the duck is very tender but not falling apart. Take the duck out and leave to cool. Cut the duck into half. Pull and remove most of the bones. Rub all over with soy sauce. Coat the duck with flour. * If the hoi sin sauce you have is very salt dilute with water and add sugar, if too liquid add a little cornflour and heat till thickened. Leave to cool. How do you make this vegetarian? Do you take out the Duck and use Tofu? This recipe is really for meat eater. Difficult to replicate with tofu. If you really want to I would suggest deep frying some firm tofu till very crispy. 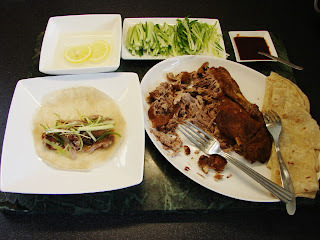 This recipe is fabulous and by far and away the best crispy duck I have ever made. Thanks Sunflower. After Luca's enthusiastic comments on wildfood, I tried this yesterday. I just wanted to say "thank you very much". It was delicious made with a couple of legs (½ quantities) from fattened moulard (foie gras) ducks and easy. Now we can have crispy duck pancakes whenever we want. Yippee. And the pancake recipe! That was really easy too and so successful. Next:- Itek Sio. Shold be another good use of the legs we can get here so cheap. Glad to hear you like the recipes. As it happens, I did happen upon that recipe too, ans it's already snagged and in my database! Jacquie was drooling almost as much as my, on reading it. Both could very well become favourites. For us, living in the sticks, the only difficulty might be to get the Plum sauce. We CAN get Hoi Sin and in any case we've got it in near industrial quantities. But we've only got one single jar of Plum Sauce. But... my niece comes out to visit in August, so all is not lost. Yum. And thanks very much.